Three operators, five stations. At first glance the video below looked like a simple lean assembly line simulation. But after watching the video for a few seconds, I noticed something very interesting. Different operators were working at the same station depending on how far along the next operator was in the operation. The video makers call this phenomenon a bucket brigade! What exactly is a bucket brigade? A bucket brigade is essentially a human chain used to transport something. The origins of this chain lie in fire fighting. Before pumps and fire hydrants, fires were put out with water from a bucket. Since you need more than one bucket of water to put out a large fire, buckets of water were handed from the person to person along a chain from the water source to the fire. Everyone worked together to get these buckets to the fire and to get the empty buckets back to the pond to be filled up. You still see examples of this today, whenever workers are handling heavy objects. Volunteers putting up sandbag walls to protect against flooding often use this bucket brigade method to pass sandbags from the truck to the wall. Even roof installers use a bucket brigade to unload heavy shingles from a truck or skid. 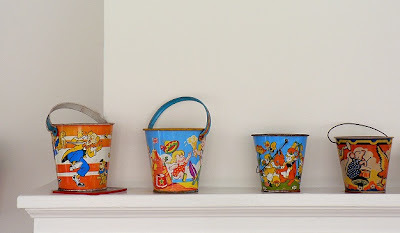 So how does a bucket brigade work in production? As you can see from the simple video below, when the last operator finishes an order or part, he walks to the next operator up the line and takes over. After the hand-off, this next operator does the same thing, going up the line to meet the first operator. The first operator then goes back to the beginning and starts a new order. Simple, yet why would you use a bucket brigade? This method is useful when you have unbalanced workflow. If one operator takes longer, the next one can pick up the slack, maintaining a constant pace. You don't have to worry about exhaustive time and motion studies. A bucket brigade naturally balances itself. A bucket brigade is a flexible workcell. Without too much up front analysis effort, different numbers of operators can run the process. If the takt time is lower due to a drop in customer demand, the labour can be fluctuated to match. Some consider when choosing a bucket brigade method of production. The workers must be aligned from slowest to fastest with the slowest at the front. This ensures that they do not catch up with each other and get blocked. Also, there must be enough work between the operators to ensure a clean hand-off. Has anyone else used a bucket brigade method in their processes? Is there an efficiency loss with extra walking and hand off fumbling? 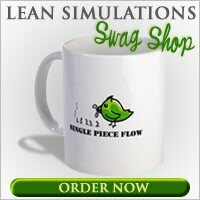 I've added this video to my list of free lean training videos, although it would also fit in well with my list of lean simulations, so I've added it there as well!